Baker should know. He got his first pair of Iversons when he was 12 years old, and still has them. He and his partners purchased the struggling historic snowshoe company just a few years ago, bent on turning around its flagging fortunes. The company was founded by Clarence Iverson in 1954 to make a better snowshoe for the State of Michigan, one that would sink less in deep snow and make walking more efficient. Iverson’s designs succeeded by optimizing weight distribution and therefore improving flotation. Word of mouth from satisfied early users was great marketing, and demand soon led to his expansion into the consumer market, serving backcountry laborers such as foresters and utility line workers. The company grew to 16 employees who produced 15,000 snowshoes each year in its heyday, but it changed hands several times over the years and even shut down for a year in the early 2000s due to poor sales. Along the way, said Baker, it also got a bad reputation among its wholesale customers for not meeting expected delivery times. Baker and his partners took over, as he says, “to re-invigorate and revitalize a Michigan product.” He saw a combination of opportunities. “We serve a niche market of people who see the aesthetics and nostalgia,” he said. “But we also continue to sell to people who make a living outdoors such as foresters and power line workers – aluminum shoes just don’t perform as well in deep snow.” While Baker and his partners didn’t do a big roll-out to retailers when they took over, he says that with their improved deliveries, customers are coming back. 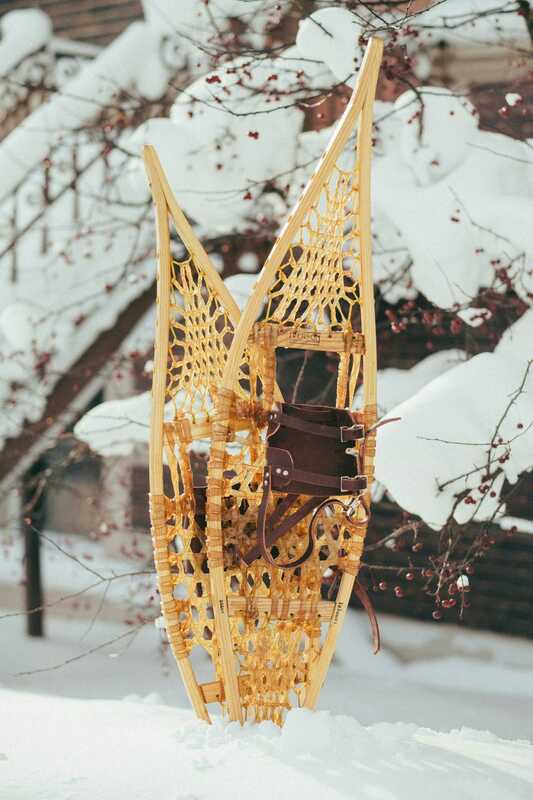 To get those efficiencies, one of Baker’s partners, Jason McEvers, a manufacturing engineer by trade, worked with Ken and Julie Holmes, two of the company’s 30+ year employees, to blend the art and craft of snowshoe making with modern manufacturing methods. The depth of knowledge and practical experience that Ken and Julie brought mixed well with Jason’s formal training and production experience, which led to a number of process improvements. 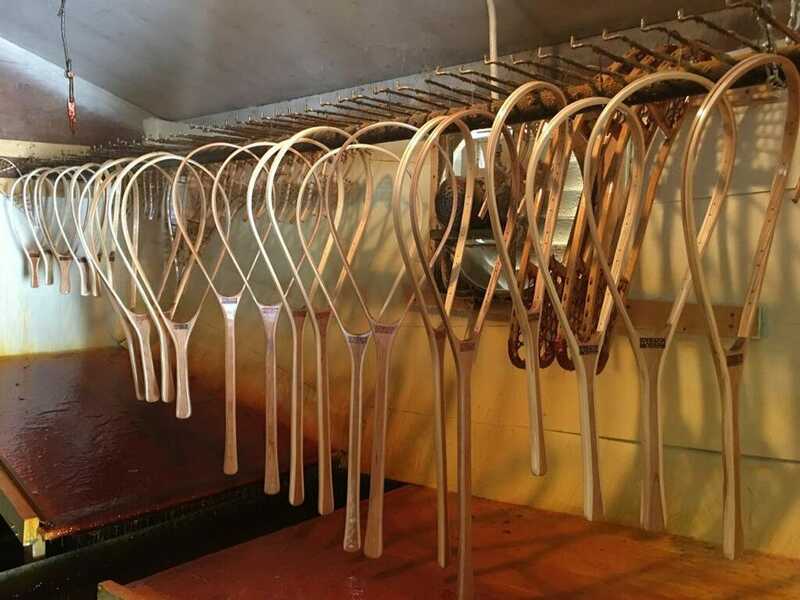 “We looked at the key variables when we steam and bend the frame, and when we kiln-dry it – things like moisture content, time and temperature,” said Baker. “We’d previously had a lot of off-spec product,” he added. Understanding those key production measures and making their process more repeatable fixed that problem. The basic manufacturing steps remain the same as in traditional handcrafting. It starts with the cutting of the white ash frame pieces. “You have to saw them in a particular way, along the grain, so they don’t break when you bend them,” said Baker. The frame pieces are then steamed to make them pliable. The pieces are still bent by hand, but parts of the process, such as bending the toe of the snowshoe up are assisted with pneumatically-actuated jigs . Finally, the frame pieces are kiln-dried, which keeps the bends from relaxing. After drying, the frames are drilled for lacing. Meanwhile, strips of either natural (rawhide) or synthetic (fiber reinforced rubber) laces are cut. Lacing the snowshoes is still done by hand. 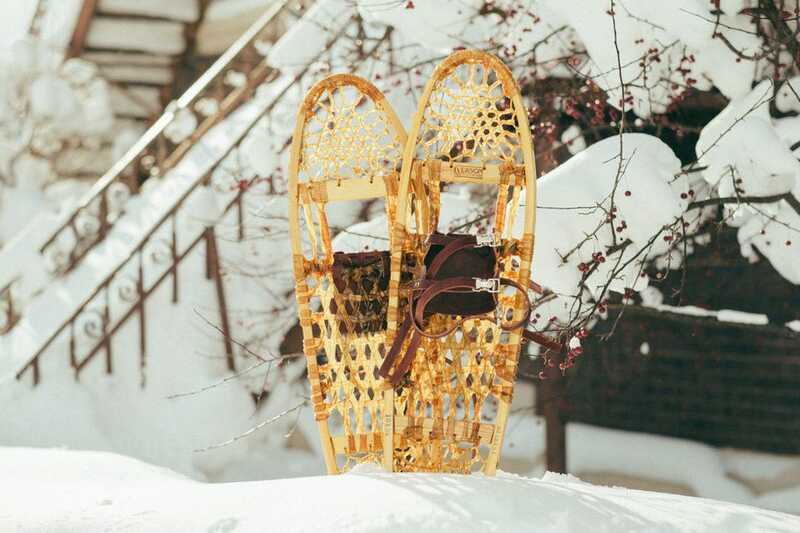 When lacing is completed, the snowshoes are coated in a specially blended urethane developed by the company for optimal durability and adhesion. Bindings are also constructed using modern methods, including a press die to cut the leather or neoprene binding shape, and a riveting machine to attach the straps. This philosophy holds true for their other products as well. 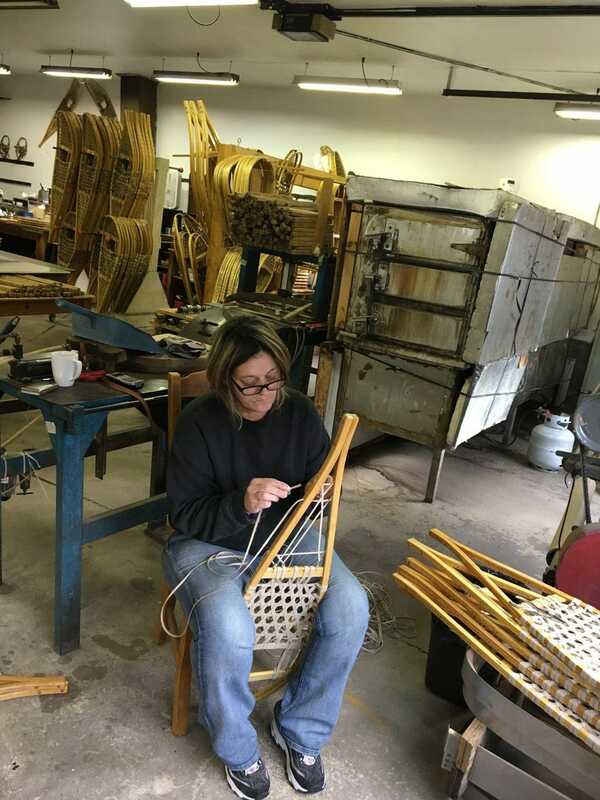 Since snowshoes are an understandably seasonal product, the company has branched out into other art and manufacturing crafts as well – stained glass, fishing nets, furniture, and clocks, all in an effort to fuel further growth and counter their sales seasonality.